I was at Google doing some research for articles to write when I stumbled on a question that was being asked. I followed that question and found more questions. 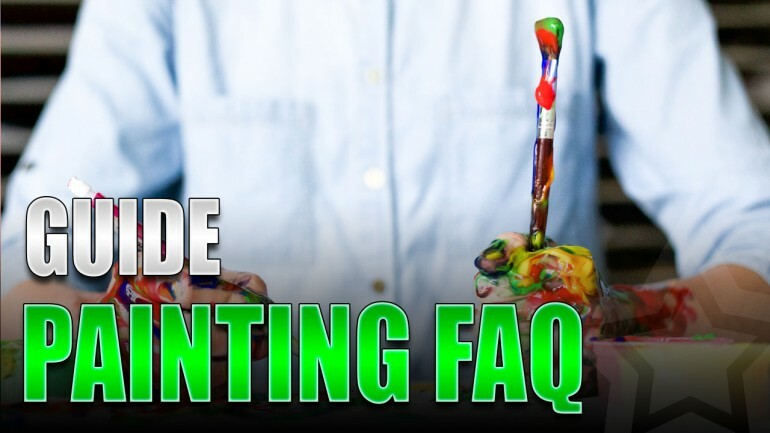 So, I thought it would be a fun idea to take the painting questions I found and compile a painting FAQ. I’ll continue go grow this list as I find more questions, and if you have any questions you’d like answered then leave a comment. Oh, if some of these are phrased a bit weird it’s because that’s how they were searched. I’m taking these straight from Google as-is. Also, there’s no order to these other than the order I found them. My aim is to keep the answers short and sweet; to simply answer the question. I’ll provide links to further resources where applicable for more in-depth answers. How to practice painting miniatures? Some people will practice on miniatures they don’t need. Most of us have some models laying around we have no use for. Well, practice on those miniatures, try out new techniques, etc. It’s what I do when I want to try something experimental. Other people just prefer to practice by painting whatever it is they need and to learn as they go. If you’re playing Warhammer 40K and you have an army to paint, then just keep painting it. Practice and experience will come along through repetition. The latter is where I learned the most. Painting an endless swarm of models for my 40K armies helped me learn brush control, basic layering and washing techniques, and speed. How to paint miniatures smoothly? The single biggest thing you can do to get smooth paint is to thin your paint. Apply a little bit of water to the paint on your palette to smooth out the paint. Then, you’ll apply two thin coats of paint to your miniature instead of one thick coat. The result will be a nice and smooth layer of paint. 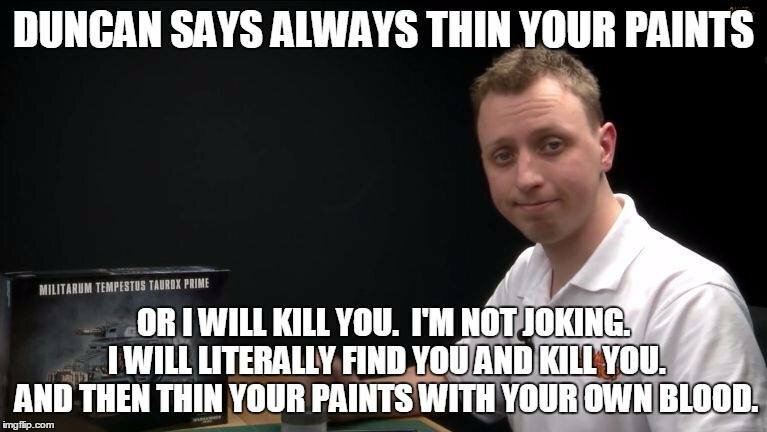 There’s a great video by Duncan with Games Workshop on thinning your paints. What are the steps to painting miniatures? 1. Remove the miniature from the sprue. 3. Clean the mold lines and seams. 4. Glue the model to the base. 6. Apply paint base coat. 7. Add additional layers for shading and highlights (washes, glazes, etc). 8. Base the miniature, IE: paint the base, add basing materials, etc. I also have an article on starting to paint miniatures that covers this with more depth. How to paint miniatures like a pro? Experience and practice are the biggest things that will get you painting like a pro. Along with that is the desire to be a better painter. Without focus and drive you will plateau as a painter instead of making steady improvements. You have to push yourself all the time and never settle for “good enough”. How to start painting miniatures? I did an entire article on how to start painting miniatures. That will walk you through getting you miniature ready to paint to putting paint on the model itself. How to paint miniatures well? To paint well you need practice and experience. There is no shortcut for either of those things. Paint as often as you can and you’ll slowly see the improvements come naturally. I do have an article on ways to become a better painter also. That will give you a lot more advice and expand on what I just mentioned. What type of paint to use on pewter? Based on this question I feel something first has to be mentioned, primer. NEVER paint directly on to pewter. You must first apply primer to the model. Once the model is primed you can use any type of paint. Being that this is a miniature painting blog, I recommend using acrylic paints. Acrylic paints dry fast, are easy to find, and clean up quickly. Best primer for metal miniatures? This is pretty subjective and we all have our preferences. That being said, I like using automotive primer called Brite Touch. However, there are a lot of choices as well that are all good and I cover that more in my primer article. 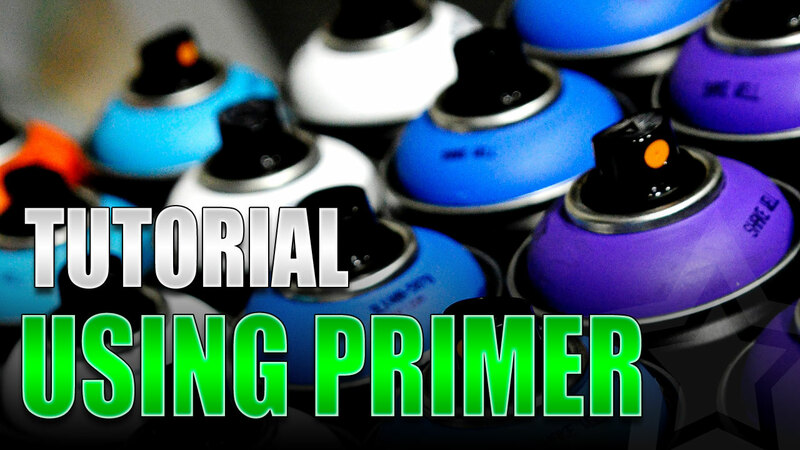 The choice of primer is a personal preference. I like using an automotive primer called Brite Touch, but I have also used Krylon over the years as well. Just like any of the primer questions here, I have a guide about primer that will help you out here. What kind of paint do you use on miniatures? Most miniature painters use acrylic paints. They’re easy to find, cheap, clean up easily, and hold up really well on the miniatures. Some of the more popular paint lines include: Citadel (Games Workshop), Vallejo, Privateer Press (P3), and Army Painter. What is a wash in painting miniatures? A wash is a watery paint that is applied over a layer of paint to create natural looking shading on the model. It has a lot of pigment and will flow into the recesses of the miniature. I have a tutorial on using washes that covers this much more thoroughly. 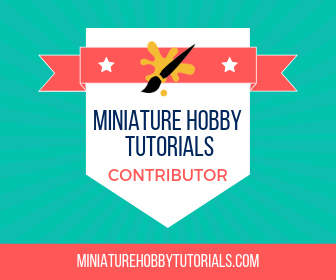 What is dry brushing miniatures? Dry brushing is a painting technique where you load your brush with paint, wipe most of the paint off on a paper towel, and lightly brush it over a miniature. The paint that’s left on the brush will deposit on the raised areas of the model and create highlighting. I have a tutorial on how to dry brush that covers this topic in more detail. How do you wash miniatures before priming? Most miniatures you buy today will not require washing. However, if you find you need to wash your miniatures then all you need is some dish soap, warm water, and an old toothbrush. Simply add the dish soap to warm water, dip your toothbrush into it, and lightly scrub your model with the toothbrush. Rinse it off and set it aside to dry. What is the best brush for painting miniatures? There’s a lot of choices here and it’s down to personal preference. The brush you’ll hear mentioned the most is the Winsor & Newton Series 7 brushes. Another great line of brushes are the Raphael 8404 brushes. A new up and coming line of brushes are the Artis Opus brushes. We do have a guide on miniature paint brushes that talks about brushes in more detail as well. As I mentioned above, if you’ve got a question then I’d love to hear it so I can expand this and answer it for you. Sometimes when you’ve been in a hobby so long it’s hard to remember those early questions you had. Also, if there’s an answer I gave above that doesn’t quite cover the question, then please let me know. Lastly, we also have a glossary of painting terms that you might find helpful. It explains common terms you hear with miniature painting with further resources.